HyperX has unleashed what it claims is the best budget gaming headset going in the form of the Cloud Stinger. The company reckons that the peripheral will make any casual gamer feel like a pro, boasting a high quality sound and an impressive level of comfort which comes for a price tag of $50 (or £50 in the UK). So, on the sonic front, the Cloud Stinger promises clear and crisp audio courtesy of 50mm directional drivers which are positioned so the sound is transmitted directly into the gamer's ear, which HyperX says produces a "broader and more accurate in-game sound". 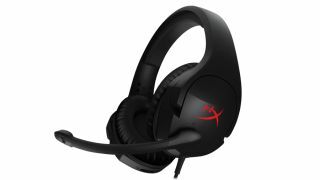 And on the comfort front, this headset uses HyperX's signature memory foam, has an adjustable steel slider to ensure a comfortable fit, plus it's lightweight at 275g. You also get 90-degree rotating ear cups (see the below pic). There is an easily accessible volume control on the headset, and an integrated noise-cancelling microphone which can be muted simply by swiveling it away from your mouth. The Cloud Stinger will happily work not just with your PC out-of-the-box, but you can also plug it straight into your PS4, Xbox One, or Wii U – or indeed many mobile devices (those which have a CTIA standard 3.5mm audio jack). Lawrence Yang, business manager at HyperX, commented: "Building on the success of HyperX Cloud Gaming Headsets designed for gamers of all skill levels, including professional eSports athletes, our new Cloud Stinger brings our quality to all players, no matter their budget or expertise." The headset is out now over in the US, and you can currently preorder in this country at Overclockers UK.